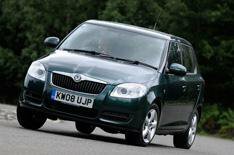 Skoda Fabia | What Car? Remember that TV ad where Skoda made a Fabia out of cake? Brilliant, original and witty. However, you can't now look at a Fabia without thinking of a Victoria sandwich and in the mould green of our test car, one that's well past its sell-by date. There are signs that the Fabia is also now reaching its sell-by date. When it was our Car of the Year in 2000, it had been given first use of the Volkswagen Group's then-new small car platform. Since then, however, VW has developed new underpinnings for small cars, but the Fabia soldiers on with something that's now nine years old. Skoda has been busy making Roomsters, Superbs and Yetis. A new Fabia has had to wait. Even so, there's still much that's admirable about the Fabia. It matches or betters most of the others for space. It rides nicely once you get it away from the manhole covers and patched roads of British towns. The 85bhp 1.4-litre petrol engine delivers a decent 98lb ft of pull with a pleasantly rorty sound. The Fabia has a better rear-seat folding system than even the new Polo. Best of all, it now costs less than 11,000 or approximately 9500 after a bit of bartering. The rest is not so good. It's the only one of our 10 cars that can't hit 45mpg average fuel economy, or undercut 150g/km CO2 emissions. Refinement is below par and the Fabia is anything but nimble. It has always been near the back of the queue for interior trim quality to keep down costs, but the advances of the past nine years have left it further behind. Resale values of around 39% also make those discounts imperative. There'll be a new Fabia next year, and we know from the Polo and, to a lesser extent, the Ibiza what's possible with the platform at Skoda's disposal. In the circumstances, the present car is doing well just to cling on.